The Premium Package is an upgrade of our Premium Seats. Enjoy all the exclusive benefits of our Premium Seats as well as a first-class buffet that includes a choice of drinks in our Premium Club. The buffet is served before the event, during the event and up to 90 minutes after the event. 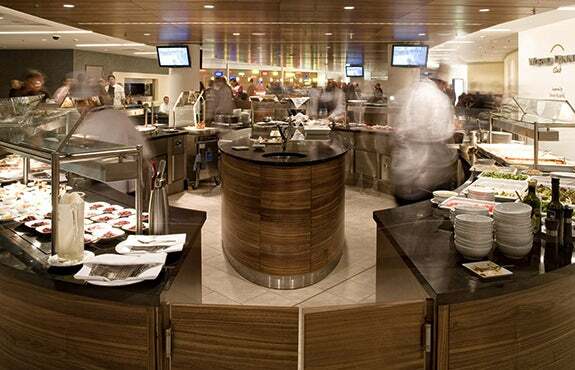 The Premium Club is a separate dining area with a capacity of up to 500 people, accessible through the Premium Lounge. Our Premium Package is the perfect combination ticket for everyone who likes to enjoy world class entertainment and catering at a fixed price. Rubbing shoulders with the stars: Enjoy all the benefits of our Premium Seats, such as the best seats close to the rink, and complimentary access to our Eisbären VIP-Club where you can enjoy a first-class buffet-style catering. It's the perfect place to meet the Eisbären players after the game and finish the evening in a relaxed atmosphere.